TAMPA, Fla. -- For Charlie Terenzio (BAMC 2010), his job varies every day. 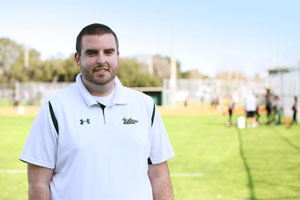 As assistant director of communications for the University of South Florida athletics department, Terenzio handles everything from press releases, video shoots and covering the teams for games and tournaments. Terenzio started out as a mass communications major at USF where he said he learned how to handle a variety of things at once and to work within deadlines. Professors tell students that internships are key to getting a job when graduating and Terenzio agrees. “The best way to put yourself in a good position for a job when you graduate is to get real world experience,” he said. Getting a variety of internships will help students decide what they like and don’t like, he said. Terenzio said students should start early, rather than waiting until the junior or senior year to get an internship. When the right one is found, then Terenzio suggests going above and beyond what is asked to stand out from among the rest. Terenzio believed so strongly in internships that he said one of the first things he did when he was hired was start a student internship program. Currently, Terenzio’s program has 15 interns working different sports. Terenzio said the program teaches the interns all aspects of sports information and communications so that when they finish school they will be in a good position to land a job that they want. Terenzio also gave valuable advice to incoming freshmen. He said it is important to come up with a plan for the future, such as setting class schedules and planning what needs to be done. Time management is equally important to juggle school, a job and internships. But not all of a student’s time in college has to be work. Terenzio said he met some of his closest friends at USF as well as meeting the woman in his life. He said he wouldn’t change a thing about his time as a student and stressed that the most important thing is to not rush through it.